After spending more than a few days with me, you’d probably guess that the Chasin’ Unicorns subscription box had been created after plugging directly into my brain. If that doesn’t show you just how much I vibed with this monthly box, I don’t know what will. I received the Dashing December Chasin’ Unicorns box for review—along with a few other bonus items I’m showcasing on Instagram—and I am beyond impressed! Not only did being called a goddess completely tickle me pink, but I opened the box right away to a selection of loose crystals. I’m a rock and gem collector, and I use them in my spiritual practice often. I also just like having natural, beautiful things spread around me, so those went directly onto my desk at home. 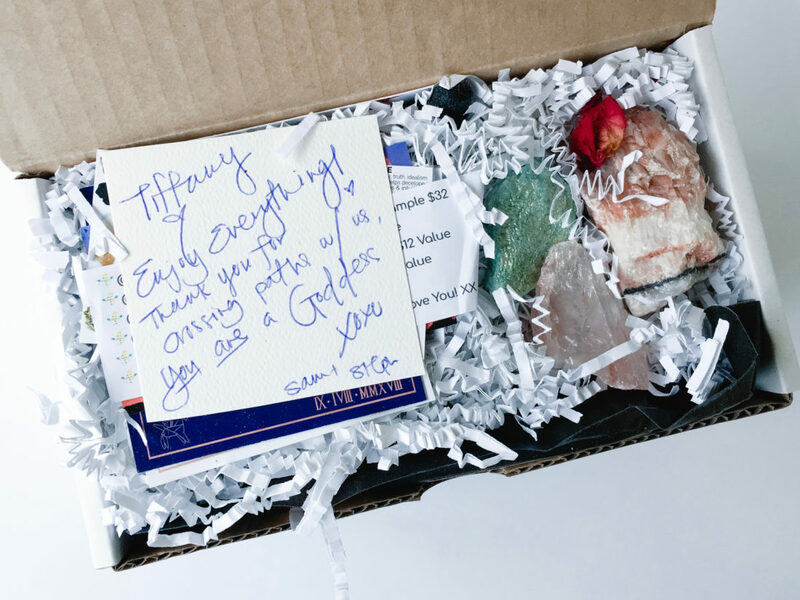 They also include a small card with information and a picture of each stone in case you’re not familiar. I could immediately smell a myriad of pleasant scents that I hoped were coming from various herbs and oils inside, and I wasn’t disappointed. Packed carefully among shreds of paper and dried rose petals were a collection of ritual cleansing and bath items perfect for my next self-care night. A candle lover through and through, I love getting new candles to try. This one from A Bird’s Moon was absolutely delicious smelling. The wax is 100% soy, and the scent was pleasantly strong without being overpowering. Personally, I don’t like when you can light a candle in one room and smell it a mile away, and this has a perfect balance of strength and scent for it’s size. Anything indulgent, natural, vegan, and crystal-infused has my vote. Chasin’ Unicorns is a full lifestyle company, so I love that their subscription boxes include their own products and that you can try them in your box and buy them in the shop later. The Unicorn Body Butter arrived in one of my favorite scents, grapefruit! I’m not a huge fan of coconut oil, but I love that this contained shea butter, sweet almond oil, and grapeseed oil. Those are definitely my favorite butters and oils to use on my skin. I haven’t used enough to get to the crystal just yet, but I’m excited to see what I find inside! This facial steam from SoapyLayne was one of the items in the Chasin’ Unicorns subscription box that I was most excited about! I am prone to blackheads on my nose, so I regularly steam my face to open my pores before I exfoliate. Adding these herbs to my steaming water made my skin feel so much more amazing! Not only that, but all of the herbs are super calming even from an aromatherapy sense. It made for a wildly relaxing facial steam, and I’m so excited to have such a big bag to continue using. The last full-size item included was the Starchild Celestial Body and Ritual Oil from Spirit Elements. Here I show it right out of the box, but if you shake it up, the entire liquid becomes a shimmering blue that doesn’t so much make you look glittery when applied but gives you a starry glow. I used this right out of the bath on skin I had just patted dry, and I was pleasantly surprised by how quickly it absorbed. Last but not least, the Chasin’ Unicorns December box included a sample of gummies from HUM. These gummies are formulated to help with hair growth, but from the ingredients I’d expect to see healthier skin and nails, too. I’m pregnant and have to be cautious about taking any vitamins on top of my prenatals, so I didn’t try these. However, I love that Chasin’ Unicorns added a sample like this. It’s a nice way to round out the box so that it really covers all aspects of your wellness inside and out. I absolutely loved the Chasin’ Unicorns box! From the branding to the box concept to every item I received, it was a huge hit. Chasin’ Unicorns definitely takes the top spot for me of favorite subscription boxes I’ve tried so far. The only disappointment for me was the lack of a product insert. I really love being able to learn more about what’s behind each product or brand or why they were chosen, and while the box did include a slip of paper with each product and the associated value, it left a lot to be desired. The items themselves were amazing, though, and Chasin’ Unicorns completely exceeded my expectations with both the value and quality of the products they curated for the December box! >> Read more Chasin’ Unicorns reviews coming soon! Love this ideal. Unicorns are in right now, especially for teenagers! Unicorn body butter sounds absolutely amazing. I’ve never heard of this subscription box before but it looks really unique! Yes! I’ve never received a subscription box like it before. Loved it! I also haven’t heard of this subscription box before but it looks really interesting – I LOVE the House Rules card! It’s one of my favorite parts! One is a card and one is a magnet. what a unique subscription box! This would be a great gift for some of my friends! I have never heard of this company/ box but it sounds amazing. I am excited to check out their website. Thanks for the review! this looks so great! Adding a bit of energy in to your day and so unique! I never saw a box like it. I will have to try it, thanks for doing the review!